Kyle Grillot - kgrillot@shawmedia.com Zach Benton, 7, Andrew Heilman, 11, and Adam Benton, 11, receives his signed merchandise from Martellus Bennett during the autograph signing at Sage YMCA Tuesday in Crystal Lake. In order to get an autograph spectators bring an unwrapped new toy or non-persihable food item to benefit Toys for Tots and McHenry County food pantries. Kyle Grillot - kgrillot@shawmedia.com Zach Benton,7, of McHenry receives his signed football from Martellus Bennett during the autograph signing at Sage YMCA Tuesday in Crystal Lake. In order to get an autograph spectators bring an unwrapped new toy or non-persihable food item to benefit Toys for Tots and McHenry County food pantries. Kyle Grillot - kgrillot@shawmedia.com Young fans watch as Martellus Bennett arrives during the autograph signing at Sage YMCA Tuesday in Crystal Lake. In order to get an autograph spectators bring an unwrapped new toy or non-persihable food item to benefit Toys for Tots and McHenry County food pantries. 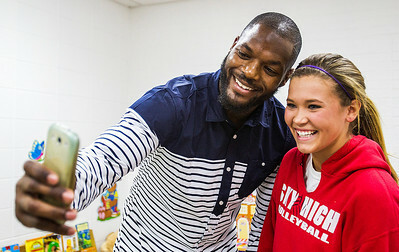 Kyle Grillot - kgrillot@shawmedia.com Martellus Bennett takes a "selfie" with McKenna Miller, 15, of Crystal Lake during the autograph signing at Sage YMCA Tuesday in Crystal Lake. In order to get an autograph spectators bring an unwrapped new toy or non-persihable food item to benefit Toys for Tots and McHenry County food pantries. Kyle Grillot - kgrillot@shawmedia.com Milton Chopa, 11, of McHenry looks at his newly autographed winter coat signed by Martellus Bennett during the autograph signing at Sage YMCA Tuesday in Crystal Lake. In order to get an autograph spectators bring an unwrapped new toy or non-persihable food item to benefit Toys for Tots and McHenry County food pantries. 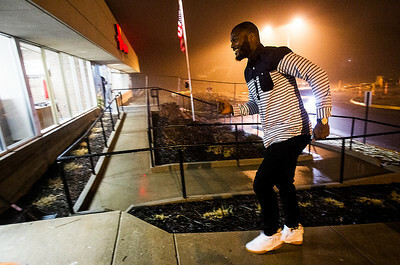 Kyle Grillot - kgrillot@shawmedia.com Martellus Bennett enters the Sage YMCA before his autograph signing Tuesday in Crystal Lake. In order to get an autograph spectators bring an unwrapped new toy or non-persihable food item to benefit Toys for Tots and McHenry County food pantries. 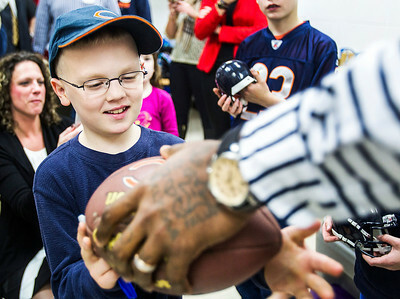 Zach Benton,7, of McHenry receives his signed football from Martellus Bennett during the autograph signing at Sage YMCA Tuesday in Crystal Lake. In order to get an autograph spectators bring an unwrapped new toy or non-persihable food item to benefit Toys for Tots and McHenry County food pantries.